Just when I thought I could transition my closet from summer to winter, we get muggy weather. Well, the good news is I’m sharing this deliciously refreshing flavored water recipe to cool you off! 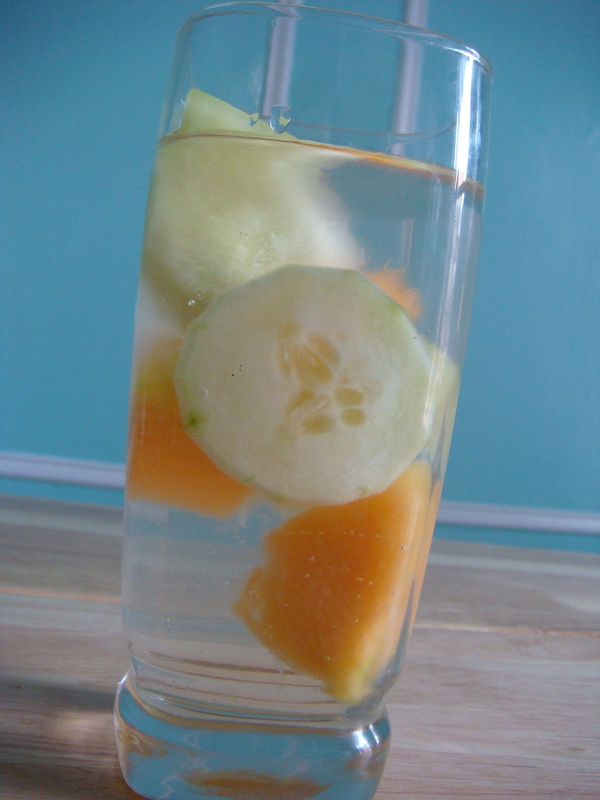 Cucumber and melon join forces to hydrate your hard-working body while raising the interest level of plain water so you’ll keep coming back for more. Notes: If using whole melons, you’ll end up using ¼ of each. Make sure the melons are very ripe, otherwise you’ll end up with cucumber-only water! This flavored water recipe is slightly thicker than plain water…if you’ve ever had coconut water, it’s similar to that consistency. 1½ cups cubed honeydew melon – Make sure it’s really ripe, otherwise it’s pretty flavorless! Add fruit and cucumber to pitcher. Fill with filtered water. Let steep in the refrigerator overnight or 8-12 hours. To serve, strain water into glass. Add portion of fruit and cucumber if desired.